This quilt block is one of the uneven nine patch blocks, so called because the final three rows of sewing are not all the same size. (You will find that many 10" blocks are constructed as uneven nine patch blocks.) However, it can be easily sewn as five rows of five patches if you prefer. 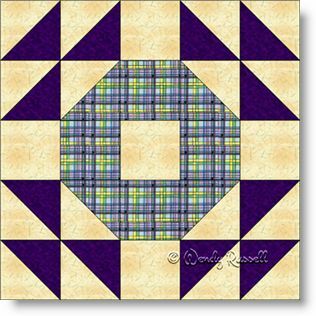 This block makes great use of the common half square triangle patches so it is an easy block to create. Some interesting layout arrangements can be made using this Crown of Thorns quilt block, as illustrated in the sample quilts shown.